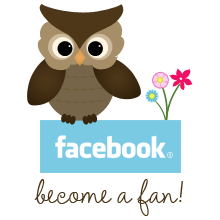 Hi Bloggers! Today it's Carol here and I have a cascading card to show you. I saw this technique on Splitcoast Stampers. You can get all the instructions by clicking here. Look how cute these "Shower Peepers" are. 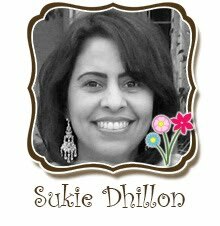 They are all just darling and this style card lets me show them all off. They are just filled with personality! When I first saw this chick I said, "Yep, that is exactly what I look like when it is house cleaning day". lol Isn't she adorable! Thank you so much for stopping by today. It was so much fun to make this and bring to you today. 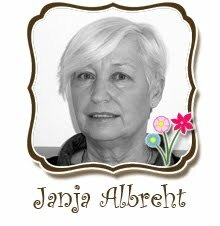 I appreciate your visit! Good morning friends! 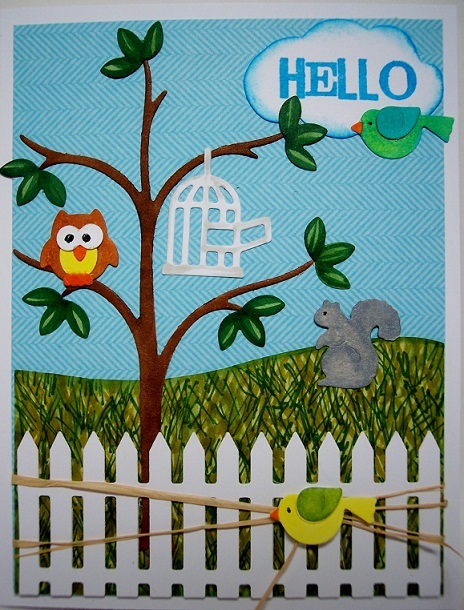 Today's card features the CottageCutz Picket Fence Border and Tree of Nature dies. I am thrilled that they now have the longer version of the Picket Fence. It is a die I will use quite often, as I like to create scenes. The Tree of Nature die is really versatile. You can make a tree with blossoms or a tree with leaves or a Fall tree. It has such cute accessories too. 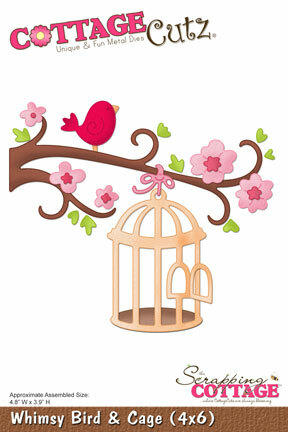 An owl, bird, bird cage, squirrel and butterflies. I cut all the images from white cardstock and colored them with copics. 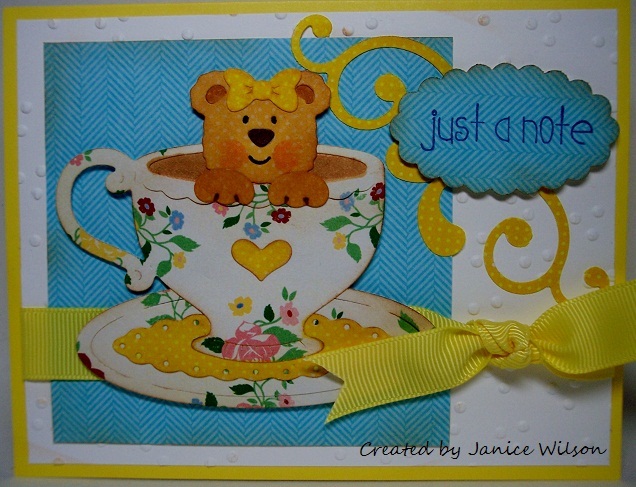 I cut the cloud freehand with scissors and finished the card with a small bit of rafia. Have a wonderful day! 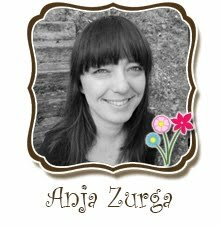 Good morning, happy Monday and welcome to The Scrapping Cottage Blog, where CottageCutz are ALWAYS blooming!! 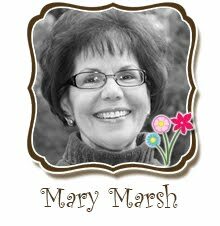 It's Lorie here today, and I've got a sweet little airplane card to share with you that I created using the CottageCutz Airplane with Banner die from The Scrapping Cottage. It's so darned cute paired with this perfectly coordinated paper, from My Little Shoebox. So happy to have you join us today. Have a blessed and beautiful day! Todays card is a Z-Tri Fold that I made for The Scrapping Cottage using the DARLING CottageCutz Dies. On to my card. I made a Z Tri Fold, i love making different folds so ive been trying to make ones that i havent seen out there yet. These are super fun, and can be used for pictures and lots of writing. there is room for writing on the inside, and the back, you can even make pockets like ive done with my Z-Gate Folds too. 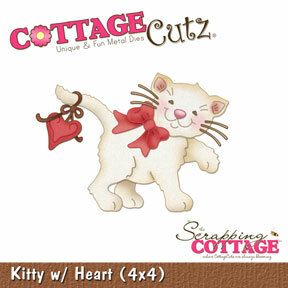 for my sweet CottageCutz kitty with heart i dusted her with antique linen distressed ink. Her bow is colored with copics. For the flowers I used the sweet whimsy bird and cage die to get the smaller flowers, i cut those out of dp from My Little Shoebox. Im LOVING the CottageCutz Pennants, I have to say they are super FUN to use, and ive been using them on a lot of my cards lately. I also think they would be perfect for mini albums and layouts!! The stickers are from My Little Shoebox and so is my design paper! I used Really Reasonable Ribbons. Fiber is some I bought from a crafting friend. I added some pearls to the little flowers. Here is my card Open! As you can see Plenty of room for writing, you can add some white card stock for the left side and write on it, also on the back too. Here is to show you how the card can sit. I wanted to show a couple different ways you can show the card. Right now you can SAVE on Select CottageCutz dies, please click the picture below to take you to the store. Also FREE shipping on all orders over 50.00 in the us. What came first . . the chick or the egg? 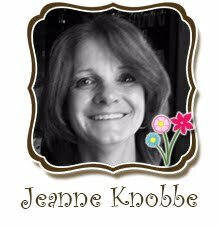 This week I have a little Easter Treat Box. . You can add two real decorated eggs, plastic eggs with treats or just a hand full of candy. This is a great gift for the office. Here I am showing you the main items that trim the basket. I used the Cottage Cutz Filigree Easter Eggs Die, this die has three style filigree eggs. (I cut five eggs) I used the swirl style filigree egg and cut from Bazzill Bling Diamond White card stock. Than highlighted with Crystal Stickles. 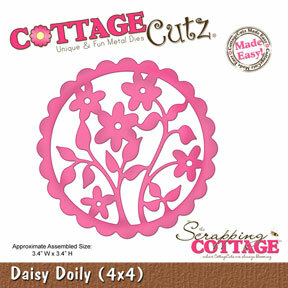 The second is the Cottage Cutz Grass Border Die. (I cut two complete strips and than cut them into two 3 1/2" and two at 1 1/2" pieces) It is real easy to cut the grass at any place. . you just cut off at the round of a blade of grass. The grass was cut from Bazzill Bling Bank Roll Green card stock. Than highlighted in green ink with a sponge. Last I added various size and colors of green seed beads to the edge of the grass for texture. I used Glossy Accents to glue the beads. 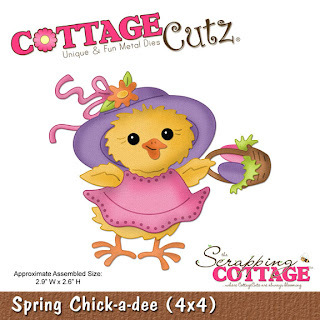 The Very Cute Chick was made using the Cottage Cutz Winter Bird Die. This little guy is not just a bird, but works great as a chick. I used Bazzill Glow Yellow card stock and highlighted with Orange Ink with a sponge. Than added a bit of Crystal Stickle for a shimmer. 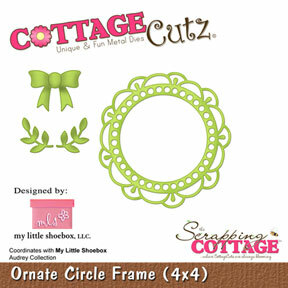 This Cottage Cutz die comes with two different clear stamps to add a face. (Wow . . I don't have to worry about a cross eyed chick, I always mess the face up when I do them by hand). With the second picture up. . you can see the two different faces. . just ink the face and add a bit of white from a Gelly Roll pen. I used foam dots to raise the face for dimension and added a bow to the under edge of the chicks face. Here is the Egg Tote. I used the five swirl eggs from the Cottage Cutz Filigree Die to randomly add to the tote. Than cut all the overlap off . (one egg on each long side, one on each side of the handle and split an egg for each end). Remember not to center, the eggs are really off to the side of the chick. I hope you can see the basic layout of the tote. You need to CUT TWO of the above. You start with two pieces of Bazzill Bling In the Pink, Pink card stock cut 5" x 7 1/2". Across the 7 1/2" side, Score @ 1 3/4", than 3 1/2", than 5 1/2" than 7". Across the 5" side, Score @ 1" than 2 1/2" than 3 1/2" only the last three blocks. Cut a 3/4" hole for the handle. 1/2" from the top. Cut as you see above. (the slits and those three outside pieces are salvage. Note: if you feel afraid you may mess-up. . .do one with a scrap of card stock first. . . Fold and glue each box. Notice I gave you flaps on the top, this is to fold in. . for added weight to the box. OPPS. . I know I showed you both boxes with handles cut. . But it is easier to cut ONE handle first, glue the boxes back to back. . than using the first hole as a template. . cut the second hole. This will make your handle line up perfect. Use a corner rounder on the top. Easy Box, no die needed. Hello everyone. Here's a little project that I did for The Scrapping Cottage using the Spring Chick-A-Dee die cut that you can find here. Isn't this a cute gift giving combination For Easter! I just love working with the Cottage Cutz Dies. It's so relaxing and I don't have to worry about having the right Copic markers to blend and shade on my images. I use Brazzill card stock in various colors. To accentuate the edges of these dies I used a stencil brush and dry brushed black ink on the edges of all the lines. This little purse was an adaptation from the Technique Challenge from last Monday found here at Splitcoast Stampers. It's called a Box-In-A Bag. I made mine 1 inch shorter and cut out my handles with the spellbinders oval dies. I also adhere my bag inside the box and not outside. Here is the little card that I made to go with the gift tote. This card is 5" x 5". I used a Martha Stewart Punch Around the Page called Cherry Blossom. I just love this sweet little Chick! Thank you so much for stopping by today. 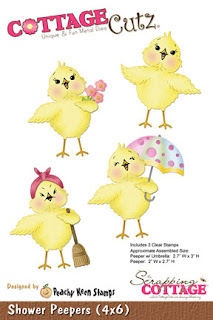 I hope I have inspired you to create some cute Easter Gifts. This was fun and so easy. Enjoy! See you soon. Hello Everyone! Today's card features the CottageCutz Springtime Tea die. I used patterned paper to cut the pieces. I chose to use the bear in the tea cup. It also comes with a bunny. You could chose not to use either for a more grown up card. Good morning, CottageCutz fans!!! It's TGIF, another weekend is upon us, and I hope you have plans for making it a great one. 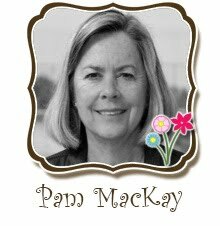 Today, I'm sharing a card I created for Easter, using some really wonderful and oh, SO EASY CottageCutz dies. I call this one an elegant Easter card, because that's exactly what comes to my mind when I see these beautiful Filigree Easter Egg CottageCutz dies. These amazing designs afford you the opportunity to make positively gorgeous creations with very little effort. With some beautiful patterned paper, glitter card stock, and just the right embellishments... VOILA! Something that looks like you spent hours!!! Now, THAT'S what I'm talkin' 'bout!! Here's my card in several views so that you can take in all the wonderful detail of these dies. I LOVE the CottageCutz Pink Peony and felt I needed to re-visit my die, and make a video showing how you can create other flowers with it. I also LOVE how the die matches the My Little Shoebox design paper. 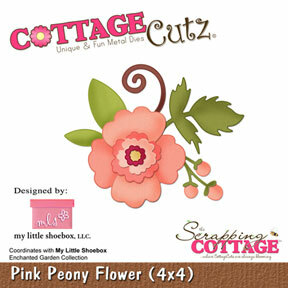 Video showing how I made my flowers using the CottageCutz Pink Peony. To visit the CottageCutz /My Little Shoebox Release please click here!